Just when you think you know what to expect while fishing in Red Lake, you latch onto something totally strange. Mostly, you catch northern pike and walleye. Then, you reel up and think, "What the heck is this?" In the photos above, Bow Narrows angler Jeff Kinzenbaw shows off a beautiful-if-odd redhorse sucker. You see some that are very large, like 10 pounds, but for some reason we only catch the smaller ones. 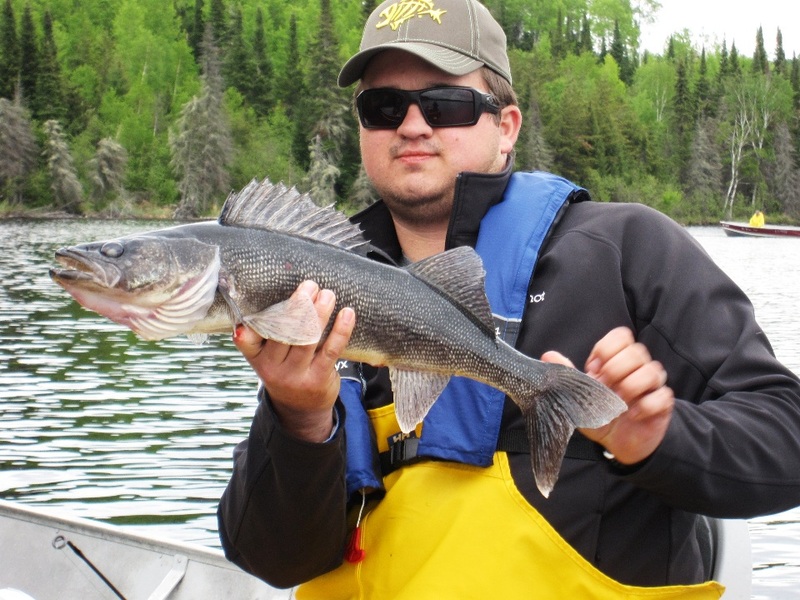 Brother Rob Kinzenbaw noticed something unusual about a nice-size walleye that he boated. It was blue rather than golden-yellow. It is, in fact, the blue-morph walleye, also called the blue walleye which is a colour variation of the species. Walleye and perch both can show this color variation. A researcher in Wisconsin is studying this phenomenon which seems to becoming more common all over the North. See Dr. Wayne Shaefer's blog. He is with the University of Wisconsin-Washington County. You might catch a "walleye" with a camo look to it and lacking white on the tips of its fins. That would be a sauger, actually not a walleye at all but because of its similarity in looks counts as part of your walleye limit. And, of course, you might hook a lake trout. These can be anywhere during the first few weeks of the season when the water is cold. You'll know it's a lake trout when you wonder if you have hooked some sort of submarine. They are extremely powerful. I mentioned perch, of course, which are all over the shallow water bays. In our family we always strive to catch the "P trifecta": pike, perch and pickerel (aka walleye). Incidentally, we have a 10-inch minimum size limit on bringing perch to the fish house for cleaning. There's another fish that can be really perplexing and I'm going to relate an actual story from two of our fishermen to show how mysterious it can be. These two guys were fishing in Golden Arm, a long narrow bay about four miles from camp, and had done well on walleye and pike when it was lunch time. Since they had taken bag lunches from the lodge, they just let their walleye jigs tipped with worms dangle while they munched on their sandwiches. There was a fair wind blowing the boat right down the bay. One of the rod tips started twitching and the angler dropped his sandwich and set the hook. Nothing. Then the other guy did the same thing with the same result. Perch? Probably not because they were right in the middle of the bay -- too deep for perch. They baited-up again, let their lines out, and no sooner did they resume their lunch than it happened again. So they baited-up another time. Then the whole thing happened again only this time they let the fish "take it" for a few seconds before setting the hook and they both latched onto something a lot bigger than a perch, that was for sure. They started cranking their catches in when each lost their fish. So they baited again and right away, both hooked up to fish. This time they played the fish more gently and got them all the way to the boat. When they netted them they were flabbergasted. "What the heck?" The fish they had boated had small heads, big bodies, were covered in large silver scales, and had large fins. They also had tiny mouths. The anglers correctly reasoned that they didn't hook the fish at first because their mouths were so small and also that by horsing-in the fish the first couple of attempts they had ripped the soft mouths and the fish had gotten away. So there's another unusual species: whitefish. And then there's the tulibee. It looks almost identical to the whitefish except its mouth goes straight ahead while the whitefish have a mouth that is longer on the top and shorter on the bottom, making it look like they have a nose. Redhorse suckers aren't the only type of suckers you might run into. There is also the white sucker which is mostly silver with a darker back. If you drop a hook and a worm around any of the dock cribs at camp you will immediately come up with a rockbass. It looks kind of like a crappie with a red eye. The strangest fish you might encounter, however, has got to be the ling, also called about twenty other names but burbot might be the most common. It seems to be half catfish and half eel. It also has the surprising habit of wrapping around your arm when you try to remove the hooks. This scares the bejeebers out of newcomers to the species and they fling it away which is too bad because it is absolutely delicious. Tastes like lobster. Rarest of all to catch but which occasionally make an appearance are smallmouth bass and musky. Finally, there is a tiny fish that you might hook accidentally that isn't a fish at all but rather a minnow. It is the emerald shiner which is commonly four-to-six inches in length. I mention this because for the last few years at camp you can encounter schools of this big-water minnow that are so dense you cannot help but hook one if you cast among them. They are currently at astonishing levels. I've seen schools that measured twenty feet in width by a half-mile in length and I have no idea how deep in the water they went. You only find them in the big bays, like Pipestone, Trout, Potato Island basin, etc. Fish love them. I have caught a number of suckers at the rapids fishing for walleye with a jig tipped with a night crawler. I have even brought some back to camp to be cleaned for supper. When I was young in western New York, we would go out at night and wade the creeks with a lantern and a spear and spear suckers. This was always done in early spring in cold water. Some people say they would never eat a sucker. I for one could fix almost anyone a sucker and they wouldn't know the difference. You just might be cleaning some this spring. Thanks for your comments, Dave. You are right, suckers are good to eat. 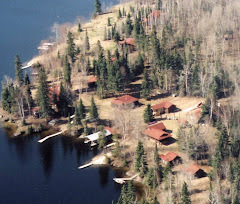 My dad and I lived on them for a couple of weeks when we were building the lodge at camp. We had flown in on the ice in early March and the ice was so bad the plane wouldn't make a second trip. Unfortunately, almost all our groceries were supposed to have come on the second plane. We had lots of dried things that had been left at camp over the winter, such as flour, beans and rice, and so had plenty to eat, except for meat. I set a bobber in our water hole through the ice and for about two weeks we succeeded in catching a whitefish every day. But then the ice started melting and the whitefish left. Fortunately the white suckers showed up and we ate suckers for the next two weeks. They were good, just bony. I tried our technique for taking out the bones in northern pike on the suckers but there were still bones and especially sharp ones at that. Anyway, we just picked around the bones and ate the rest.